Opinions are like noses — everybody has one. Trying to take those opinions and convert them into meaningful data requires careful polling techniques in order to make the results statistically valid. The Pew Research Center has established a reputation for using high quality polling techniques that generate meaningful results. The latest Pew poll finds an astonishing difference in opinion between Republicans and Democrats about climate change and protecting the environment. Overall, two thirds of Americans say the government is not doing enough to reduce the effects of global climate change. 19% say the government is doing “about the right amount” with another 13% saying “too much” is being done. But the findings between Republicans and Democrats reveal a sharp divide between the two groups. Almost 90% of Democrats believe the federal government is not doing enough to protect key aspects of the environment such as air and water quality but few Republicans agree. Specifically, 89% of Democrats say the federal government isn’t doing enough to protect air quality. Only 26% of Republicans say the same thing. On the subject of water quality, 91% of Democrats say the federal government isn’t doing enough compared with 39% of Republicans. If it seems that Democrats and Republicans live on two different planets, there is one issue on which they both agree. 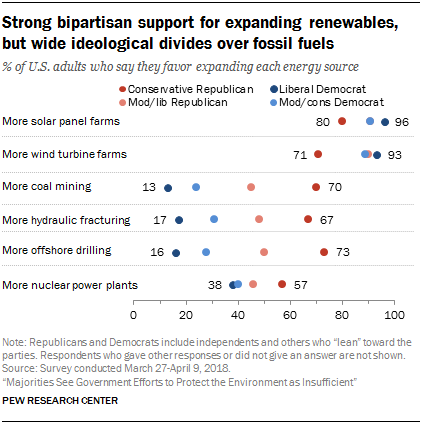 The Pew poll found that large majorities of Americans favor expanding at least two types of renewable sources to provide energy: 89% favor solar panels and 85% favor wind turbines. 80% of Republicans want to see more solar energy resources and 71% want more wind power installations. Among Democrats, those numbers are very close to 100%. Predictably, most Democrats believe government regulations are necessary to drive the expansion of renewable energy while most Republicans believe the free market will take care of things very nicely without the heavy hand of government disrupting the business community, in much the same way free enterprise protected people from rapacious banks and insurance companies during the first years of this century. The Pew report is long and detailed and it makes it clear that Republicans and Democrats have a hard time agreeing on the time of day or whether the sun rises in the east. But on the topic of renewable energy, there is something close to a political consensus. That’s good news for us all.